Looking for an easy, last-minute appetizer? 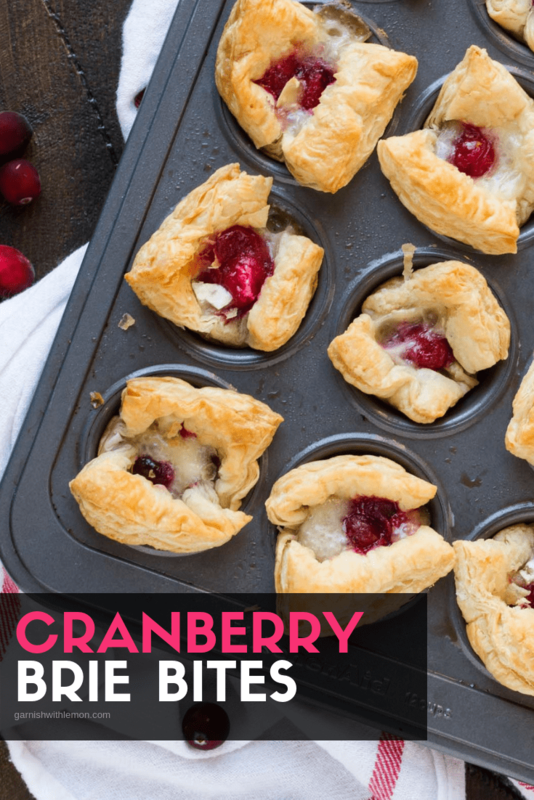 These Cranberry Brie Bites are a great way to transform extra cranberry sauce and make a delicious party snack! There are 2 camps for cranberry sauce: the lovers and the haters. You really don’t find people indifferent to it. I’m a lover and the rest of my family? Not so much. But when I put it in these Cranberry Brie Bites, it’s a whole new ball game. This easy appetizer will become one of your go-to party snacks. 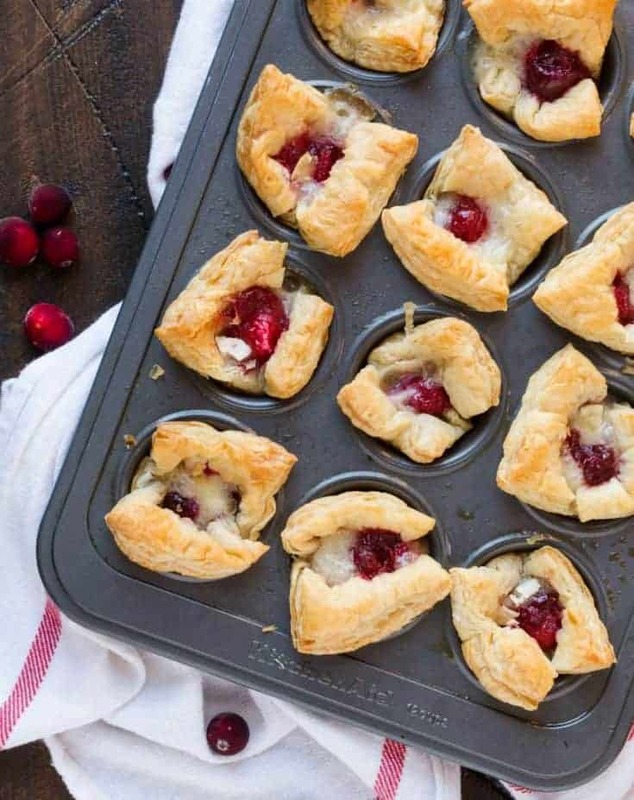 These Cranberry Brie Bites use just 3 ingredients but are so full of flavor that people won’t be able to stop popping them in their mouths. Its easy to understand why. After all, ooey gooey Brie cheese and tart cranberry sauce has to one of the most brilliant flavor combinations ever. Wrap it all up with a flaky puff pastry, and you have hit appetizer heaven. And the good news is, they can be on the table in just 20 minutes so it’s easy to make anotter batch . Better yet, save yourself the time and make a double batch right off the bat. The best part of these tasty morsels? I now have a reason to make cranberry sauce anytime of the year and don’t have to worry about tossing that leftover cranberry sauce again. Time Saving Tip: Don’t have any puff pastry on hand? Pop the cranberry sauce and brie into mini phyllo cups instead! 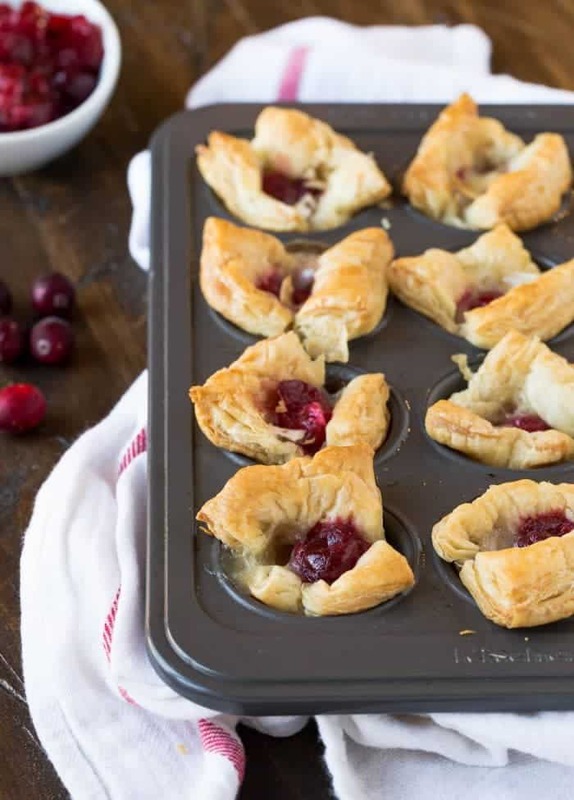 These Cranberry Brie Bites use leftover cranberry sauce to make a great party snack! Grease small muffin cups with cooking spray and preheat oven to 400 degrees. Slightly roll puff pastry dough out and cut into 3 pieces the sort way and 4 the long way, making 12 squares. Place puff pastry dough in muffin tin and press into bottom of cup. Bake puff pastry dough for 10 minutes or until lightly brown. Remove from oven and add 2 teaspoons cranberry sauce and 1 small cube of brie cheese. Bake for an additional 5 minutes and serve immediately or at room temperature. Brian wants to make these delicious bites, they look Devine!